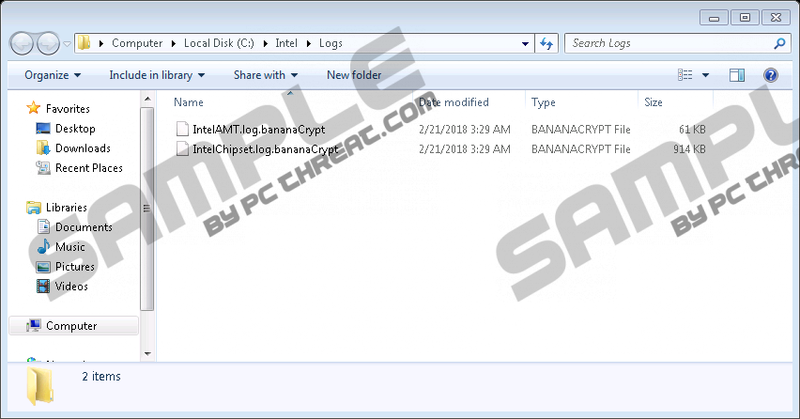 Not much is known about Bananacrypt Ransomware, but what it is clear is that the malware was designed to extort money from unlucky users who encounter it. Our researchers say the malicious application could enter the system while opening a malicious email attachment or other suspicious data encountered while surfing the Internet. What’s more, it seems once launched the threat should immediately start the encryption process during which the malware is supposed to lock all user’s private files with a strong encryption algorithm. It is easy to notice these changes as the file not only becomes unrecognizable by the computer but also gets marked by the malicious application with .bananaCrypt extension. Since we do not think paying the ransom is a smart idea, we recommend removing Bananacrypt Ransomware right away. To assist you with this task we will add deletion instructions at the end of this text, but if you still have any doubts, we urge you to read our article first. As you probably realize, Bananacrypt Ransomware is a type of a malicious application that the user receives without even realizing it. In other words, the malware could enter the system by deceiving the user and pretending to be something else. For example, the threat’s installer could look like a text document, a photograph, a legitimate program or an update, and so on. For those who wonder how they may come across such data, we would say often it is received via malicious Spam emails or downloaded from suspicious file-sharing web pages, after clicking doubtful pop-up ads, etc. Therefore, to keep the system clean and secure, you have to put some effort, for example, stay away from file-sharing web pages, investigate email attachments from suspicious senders before opening them, and so on. Probably, one of the easier options is to acquire a reliable antimalware tool. It can help guard the system not only by warning the user about potential threats but also by helping you to check suspicious data. Unfortunately, if the malware’s installer is launched and the system is not able to protect itself, Bananacrypt Ransomware should immediately identify all targeted files and start encrypting them one by one. During this process all data should be marked with a specific extension, for example, a file called flowers.jpg would turn into flowers.jpg.bananaCrypt. Then the infection is supposed to drop a text file named readme.txt on user’s Desktop or other locations containing encrypted data. According to this note, the files were locked, and nothing can restore them besides the decryption tool from the malware’s creators. In exchange for it, the hackers might ask payment of around 300 US dollars. Besides, they could demand the sum would be paid in Bitcoins. Needless to say, putting up with such demands when there are no guarantees the malicious application’s creators will hold to their end of the deal and provide the decryption tool they promise, might be most unwise. Thus, for anyone who would not like to risk his savings our researchers recommend ignoring the ransom note. Instead of paying the ransom you could simply erase Bananacrypt Ransomware. It will not decrypt any data, but at least this way you can start afresh. Also, users who have backup copies could easily replace encrypted files with them, just first it is essential to make sure the threat is eliminated. Our researchers say you can get rid of Bananacrypt Ransomware by erasing its installer and the ransom note. The instructions you can see a bit below this text will show how to do this manually. On the other hand, if it looks a bit too difficult or you simply prefer using automatic features, you could download a reliable antimalware tool use its scanning feature to locate the infection and remove it automatically by pressing the given deletion button. Quick & tested solution for Bananacrypt Ransomware removal.